Homemade furniture polish does wonders for your wood furniture by cleaning, moisturizing, and protecting it at the same time. It also costs just pennies to make and doesn’t fill your home’s indoor air with aerosol fumes or chemicals you don’t recognize. You’ve probably heard that commercial polishes can, over time, lead to buildup. That’s because they contain silicone to offset the effects of other ingredients. Since silicone bonds with itself, every new application is putting down yet another layer of it. 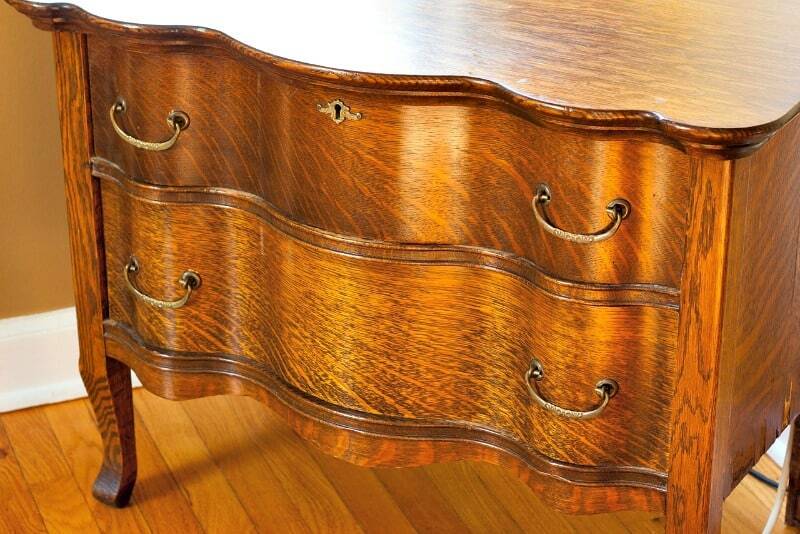 Dust and humidity get trapped between those layers, so eventually, your furniture looks dull and grimy. Crazy, isn’t it? You use a product designed to give your furniture a beautiful shine then because you’re using that product, you wind up with furniture that’s not shiny at all. To make matters worse, dust clings to silicone, so you’re making more work for yourself. When I noticed that my coffee table and other wood furnishings were looking awful, I set out to find a furniture polish that would clean, shine, and protect my furniture without grabbing onto every bit of dust in the room. Let me tell you, with two furry cats and a dog, things were looking awful until I switched to making my furniture polish. It’s so much cheaper than the commercial stuff, too. If your furniture has a severe build-up problem, you’ll want to follow these steps to remove the sticky wax buildup before switching to homemade furniture polish. As far as application, flannel baby wipes work great. For more about the cleaning tools and supplies that I use in my home, check out my Recommended Products Page. 1. Add all ingredients to a spray bottle and shake well. Spray onto a lint-free cloth and wipe onto furniture for light polishing. For a more substantial gloss, spray directly onto furniture and buff to a shine. 2. Store your homemade furniture polish in a dark, cool cupboard to keep the oil from turning rancid. Replace it monthly, and always shake before use. I was gifted a dinning room set that was at least 60 years old. The finish on top was very cloudy and I figured it may be due to years of polish build up. I used your vinegar and water recipe and the build up came off right away. The table looked so much better it was surprising. Thank you so much for the tip. I’m going to us your DIY furniture polish on it. 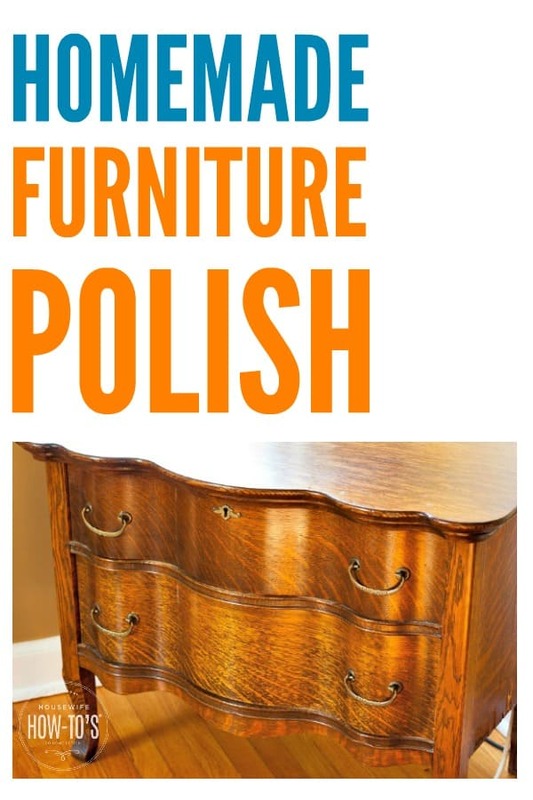 One question though, if the furniture has a finished coat as they usually do how does this polish penetrate that to get to the wood and no just lay on top like other polishes? I’m glad this helped you get rid of the buildup! Unfortunately, no polish will penetrate a layer of polyurethane or varnish. Can i use your solution mix on my carrom board? To be perfectly honest, I’ve never used it so I don’t know the exact answer. I looked up the product and can’t find where its ingredients are listed, either. I think I’d follow the directions in my article about How To Remove Wax Buildup From Furniture… but be sure to heat the water and vinegar first. If that doesn’t work, you can try mineral spirits (known as white spirits or Stoddard solvent in the UK). Follow the directions on the bottle, and be sure you’ve got good ventilation. Does this work on furniture that has a wooden vaneer over particle board? My furniture is both real wood, and the other kind that has a wood-like “sticker” over it. (does that make sense?) We live on the beach, have three kids and a cat, so it gets really dusty in our house, and it’s generally mixed with sand and whatever else blows in with the trees/bushes. What do you suggest? It can, provided the veneer is completely made of wood and not coated with a layer of plastic. When I lived on the beach in Hawaii our home got dusty, too, since the windows were usually open and the trade winds blew in all sorts of sand. I found that using a damp microfiber cloth to wipe everything down on a weekly basis, and going over the horizontal surfaces daily with a Swiffer duster, helped quite a bit. I don’t have lemon essential oil but I do have orange would that be okay to use? I love this cleaner! It worked really well on poorly taken care of dining set I found at a garage sale. However, I couldn’t get the squirt bottle to work; It clogged up after only one spritz. (I ended up just pouring some on the rag and wiping the furniture down.) Is there a special kind of olive oil I should be using? I used the EVOO I use in the kitchen. I’m so glad you like this cleaner! There’s no special EVOO to use, but different spray bottles act differently. Using it on the rag and wiping down like you did is a perfectly acceptable alternative — I do it that way sometimes, too. I use furniture polish (pledge) to clean my leather furniture. Do you know if your recipe can be used on leather? If not, do you have any homemade recipes to clean leather furniture? First off, I’d strongly encourage you to stop using Pledge on your leather furniture. It’s not made for that! Keep in mind that leather is skin and that Pledge Furniture Polish contains silicone. Just as silicone would build up on your skin over time and lead to problems, it can build up on your leather over time, too. As it does so, it will be trapping stains and dirt, and harming your furniture’s finish in the long-run. As to using my furniture spray on leather furniture, yes it works on leather furniture AND it doesn’t contain silicone! In fact, you’ll find most DIY leather cleaners use pretty much the same ingredients as my furniture polish! Since you’ve been using Pledge, you’ll need several rags the first few times you use my furniture polish on your leather furniture as it cleans away the Pledge buildup. Just keep reapplying and wiping until the cloth comes away clean, then give it one more round to condition it. Why doesn’t the olive oil go rancid on the furniture? The type of fats in an oil largely determine whether it’s going to go rancid or not. Olive oil is primarily unsaturated fat, and thus less likely to go rancid. The acidity of the vinegar and lemon oil, both of which are also anti-bacterial, also helps prevent it from going rancid once applied to furniture. That said, you don’t want to leave a bottle of this sitting out in bright light, and you want to use it within a couple of weeks. I’ve been obsessively reading through your posts the last few days and have loved many of the tips. I was wondering if you just washed & dried the cloths you used with the furniture polish? I have read that it is not safe to dry cloths that have been used to clean with oil. However, I will admit that I’ve done that countless times without any trouble! Thank you! Yes, I just run them through my washing machine in a load on their own. discussed here? I’d really like to be a part of group where I can get feed-back from other knowledgeable individuals that share the same interest. If you have any recommendations, please let me know. Bless you! We have plenty of discussions of these topics on the Facebook page, although I may add forums in at some point. Thanks!